Durham is a city in northeast England, south of Newcastle upon Tyne. 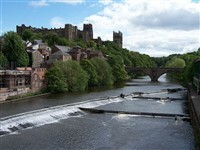 The River Wear loops around the Romanesque Durham Cathedral and Norman Durham Castle. Take a walk through the cobbled streets of Durham City where you'll find high street favourites alongside independent shops, boutiques and quirky craft shops - it really is retail heaven! What's more, you can enjoy both indoor and outdoor shopping experiences at The Gates and Prince Bishops shopping centres. And while you're there, don't forget to check out Durham Markets too.